I have almost a fetish to cauliflowers. Maybe only second to aubergines. As you’ve seen previously in my blog. Another thing those who know me from the pre-vegan times might recall, is my endless love to hamburgers. And since industrial veggie burgers are not by any standards good, at least none of those I have tasted, I’d go for something new, that will combine two of those great loves. 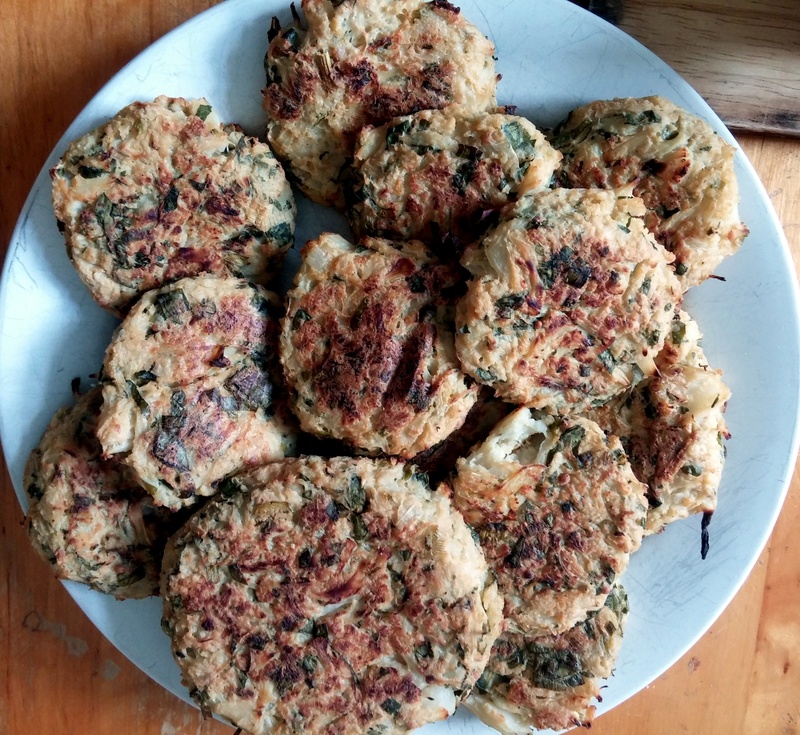 You can put these patties in a burger bun with your favorite sauces, on a plate with a side dish, in spicy tomato sauce or even keep them for the next day and take them in a sandwich for work. Take one medium cauliflower as the base for the amount in the recipe, this is around the amount of end-result you see in the picture above. So next to the cauliflower you’ll need 1 medium-large potato, cooked in its peel and pureed. 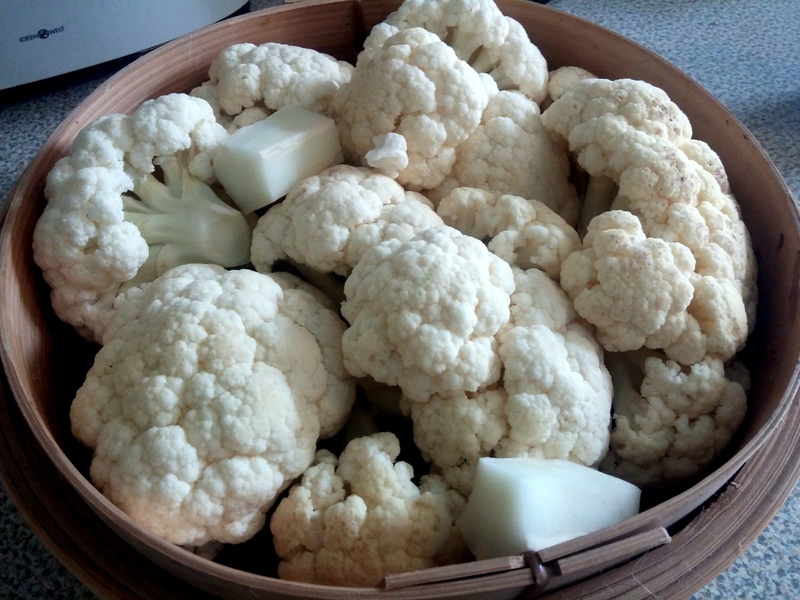 The cauliflower also needs to be cooked, I prefer steamed, for around 15-20 minutes in a steaming basket, until its soft but not mushy. In case you cook it in water, 7-8 minutes will do. But then, before you mash it, dry it a bit in the oven. Two spring onions, finely chopped. Chopped Parsley and fresh thyme, as much as you like. 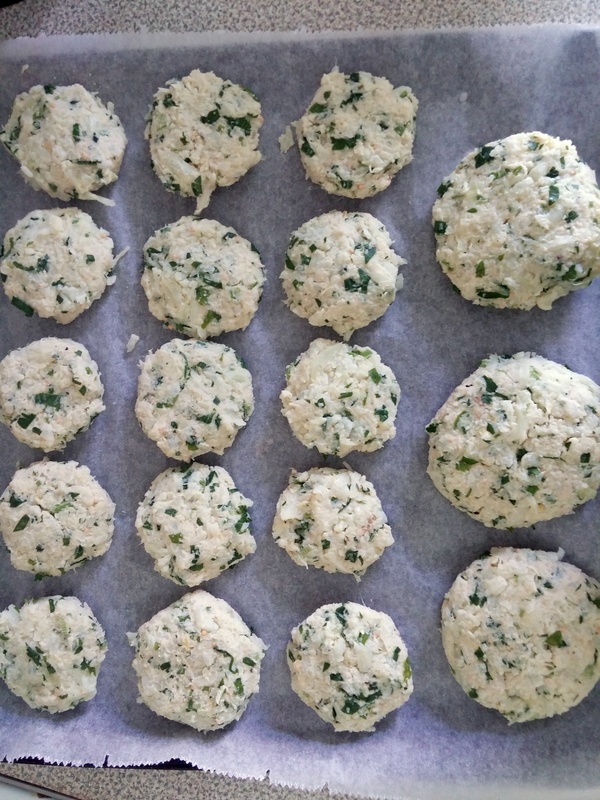 Flours: 1 tsp potato starch, 1/4 cup oats, ground to powder, 1/4 cup gram (chickpea) flour. Grated zest of one small lemon. 2 spoons of tahini (or 3 spoons ground cashews, if you don’t like the taste). 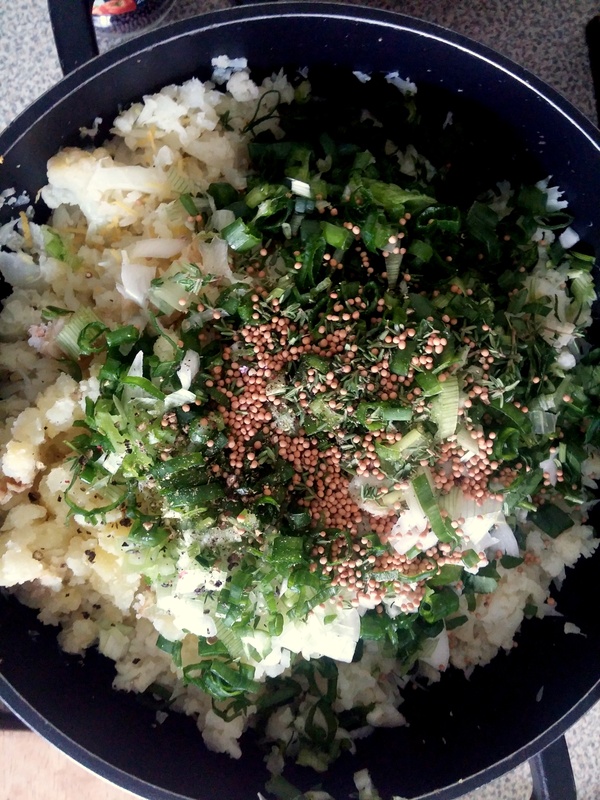 Season with salt and pepper, and if toy want also mustard seeds. Mix everything well and let it rest for at least an hour. Make the burgers in the desired size, place on baking paper and send to an oven with 220 degrees Celsius for around half an hour, until they are golden and stable. Then flip and send back for 10 more minutes. Let them cool to stabilize before serving. After that, you can throw them on the grill in your next BBQ party, and from there to a bun with tomatoes, lettuce, indian pickled mango sauce and soygurt with spring onions, like I did in the picture, or just munch on them one by one until you decide what to do with them. 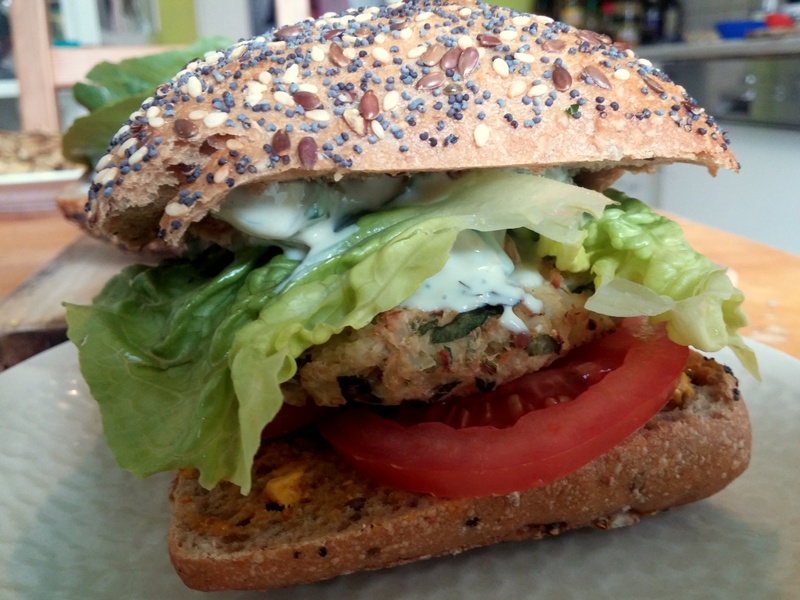 Posted in Main Courses, SubstitutesTagged Cauliflower, Vegan BBQ, Vegan BurgersBookmark the permalink.